Remember That ‘70s Show? That freaking show ran FOREVER, but it was one of those things you always could turn on and it would usually be funny. 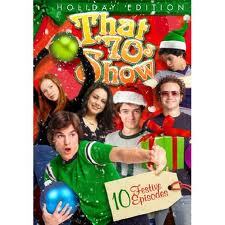 There were a total of five Christmas episodes over the eight seasons, and they were all pretty enjoyable to watch. It took us awhile to get into this episode from the first season. As the complications and subplots mounted, we were amused, but weren’t engaged. By the end, though, it started to come together. Among other threads, this followed Eric’s attempt to throw a Christmas party (with beer) in the basement, Red having to work Christmas Eve, and Hyde trying to impress Donna with a gift. Not a bad little Christmas episode. By the time we were watching this one, we were back in the rhythm of the show (and we were watching a later episode, so the quality had picked up a little). I know I’ve seen this episode before: it's about the boys getting drunk unsupervised at Hyde’s father’s place, and Eric’s parents meddling, but in a productive way. There were some really funny sequences in this one, and some good feeling under the funny in the way this show sometimes did well. In this one, Eric gets conned into directing a Christmas pageant, so of course he gets everyone to be in it, and their ideas are... unique. A dream sequence in the middle is overplayed, but a faux-stop-motion sequence near the end was pretty great, and the pay-off on the running gags was actually awesome. It’s really odd to be jumping around in this show, it reminds me of all the weird plot twists, both good and bad, that appeared over the course of the run. We started out being pretty skeptical of the plot hook: that when the guys attend a high school Christmas party with Jackie, all the high school girls think they’re awesome just because they’ve graduated. However, most of the jokes that spun out of the situation actually worked really well. Also, Red is a mall Santa to hilarious effect. This wasn’t as good as some of the earlier Christmas episodes. A lot of the jokes were really good, but the story to the episode was really lame. Kelso takes all the toys collected for the toy drive, and the guys play with them. Jackie and Hyde fight (whatever). Again, we laughed, but it ended with a bit of a whimper.